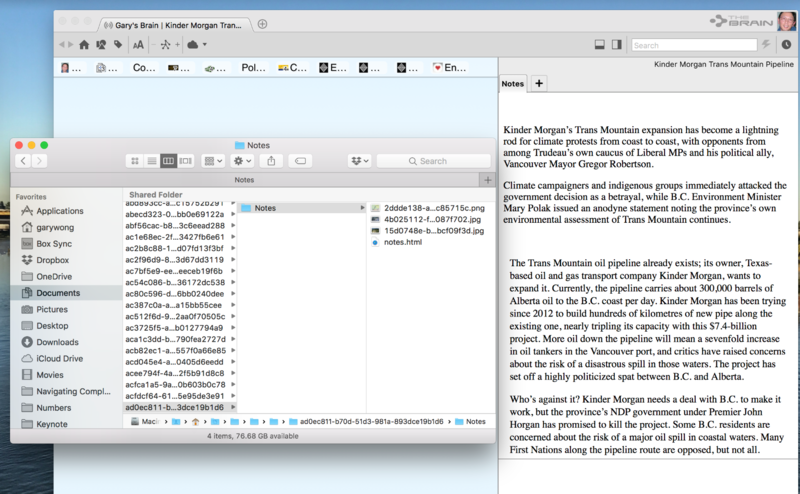 Notes created on the Mac, including images. Work on the same note on the iPad. Works beautifully, images are there. Notes on the Mac now lack the images, no sign they ever existed. Blank spaces show the spots where images have been. Notes on iOS still show images. In oder words, I cannot work on a note in iOS that contains images. Which version of TheBrain desktop are you using? Do you recall exactly how the image was added to the note? Copy/past from the web with other text? copy from local file and pasted? drag and drop? etc. This is a follow-up to my previous request #59214 "Limitation of iPad app?" 3 images to show what happens. Tedious workaround is to save JPG as attachment in iPad, move attachment to Notes section in iMac, check in iPad that JPG is now showing in Notes section. I've confirmed that the iPad JPG file does not make it into the Thoughts Folder on the the iMac. I first noted the problem and reported it back in May 2018. I checked on this feature, and we do not yet support copy paste to notes on mobile yet. You will need to share this item to your Brain's inbox, then attach from there. Matt, I am running the latest versions, 9.1.11 on the mac and 9.0.8 on iOS. The pictures were added on the mac as drag and drop from Photos via the Yoink app. The pictures are still there on the ipad but have disappeared on the mac and iphone. I just uploaded to TB 9.1.12.0 on MacOS. Images in Mac, iPad, iPhone, desktop have disappeared. On iPad and iPhone, the "square box" where the image should be is displayed. Strange part is that the 3 images are still stored in the Thoughts folder on the MacBook. I quite TB and restarted but to no avail. Suggestions? Thanks everyone for posting. I've been able to replicate this issue and will document for further review. This problem was fixed in the latest release. (9.1.2). Fix works for images added on the mac, thanks! But images pasted into the iOS TB (latest version) seem not to synchronize to the desktop. Andreas is correct. Images pasted into the iOS Notes section don't sync to the Cloud. I believe this is another iOS problem that's still outstanding. Thanks for posting. I've replicated this issue and documented for review. This problem has been fixed in 9.1.4.1 (which is currently only available via TestFlight and is not in the App Store yet). Harlan: In a separate reply, I did a couple of tests. I was hoping the problem of an iOS image not making to the Cloud would be fixed in 9.1.4.1. Alas, it wasn't for me. For the image that you pasted in on your iPad pro, what I think happened is that when you synced the note had not actually been saved yet on your iPad and so did not get sent to the server. When you edit a note on iPad, it doesn't save until you navigate to another thought or sit idle for a little while. To see if that is the problem, please try pasting an image into notes on your iPad, navigating to a different thought, then syncing. We are adding a save of the active thought's note prior to a sync to avoid this issue in the future. Hi, Harlan. Sorry for creating confusion. For the first problem, I pasted an image on my iPad Pro, navigated to a different thought, and then manually synced. Yes, the image was saved to the server and appears on the desktop. So I believe the problem was I wasn't leaving the thought after pasting and immediately manually syncing. Adding a save of the active thought's note prior to the sync definitely is a process improvement.